For the fifth consecutive year, Baltimore County has been ranked among the top ten counties in the U.S. according to the Center for Digital Government‘s 14th annual 2016 Digital Counties Survey in conjunction with the National Association of Counties (NACo). Among the counties that participated, Baltimore County earned the sixth place ranking in the category for counties with populations of 500,000 or more. The award recognizes counties considered to be “digital leaders” in terms of aligning technology initiatives with strategic priorities to provide significant cost savings and administrative efficiencies. 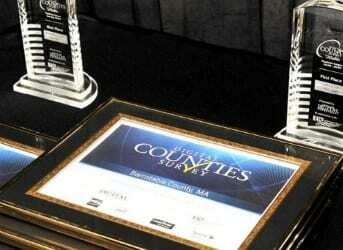 This year, the survey recognizes leading counties across the nation that focus their technologies and innovations to enhance the lifestyle of people in the county. Topics in the survey included: transparency in government, mobility and mobile application initiatives, citizen engagement, collaborative initiatives, cybersecurity, hiring and retaining competent staff, broadband and wireless infrastructure, efficiency, resiliency, and the use of innovative and best practices. Baltimore County will be honored as a top-ranked county at the 2016 Digital Counties Survey Awards Reception during NACo’s Annual Conference & Exposition in Long Beach, California and will receive the Digital Counties Survey Award. Additionally, winners will be featured in the Center’s best practices and thought leadership white papers. The Digital Counties Survey is hosted by the Center for Digital Government, a national research and advisory institute on information technology policies and best practices in state and local government. The organization also provides government, education and industry leaders with decision support, research and educational services to help them effectively incorporate new technologies in the 21st century. This survey is conducted in partnership with the National Association of Counties (NACo), a full-service organization that provides legislative, research, technical, and public affairs assistance to county governments. Congratulations to the 2016 Digital Counties Survey Winners!